Wearing the maple leaf and representing his country has a very important significance for Jesse McIntyre. McIntyre recently won a silver medal alongside his brother Cody and the Canadian team at the 3rd World Deaf Ice Hockey Championships in Amherst, U.S. Native of Brucefield, Ont., McInture is profoundly deaf since he was 4- years old due to accumulated fluid in his ears when he was born. His brother Cody and sister Hailey are also profoundly deaf. The McIntyre began to play hockey when they were 4-years old. 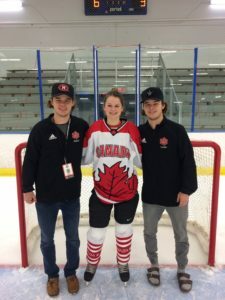 Since then it is a family affair as the McIntyre brothers play together, and Hailey plays with the Canadian Deaf Women’s team that took part in its first international competition in Amherst. Twenty-two-year-old McIntyre discovered Deaf hockey during a hockey camp when he was 16. “Casey O’Brien (former player on the Canadian Deaf team) told me about the opportunity to play for Team Ontario,” said Jesse. A few months later the McIntyre brothers took part in Team Ontario tryouts, even though they were too young to be selected. The experience was worth it. When the time had come to qualify for representing Ontario at the 2012 Canada Deaf Games, the McIntyre brothers were selected. Team Ontario won the Gold medal. Sine then, Jesse and Cody represented Canada several times on the international stage. Their first competition with the Canadian Deaf team was at the 2014 World Deaf Ice Hockey Championships in Finland. Over the last four years Jesse played for the Goderich Flyers Junior ‘C’ in the Western Junior C League in the Ontario Hockey Association while completing his studies in Sports and Recreation Management at the Lambton College. 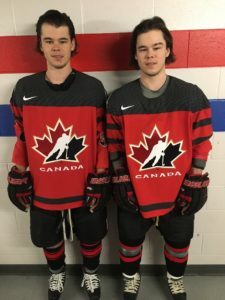 The McIntyre brothers would like to play for Team Ontario and Team Canada again. The next Ice Hockey events are at the 2018 Canada Deaf Games in Winnipeg and the 2019 Winter Deaflympics. If Women’s Ice Hockey become an official sport at the Deaflympics, Hailey could also play. McIntyre now lives in Windsor with his partner, and will begin his studies in Human Kinetics at the University of Windsor in the Fall 2017.